As promised I'm posting what I can from my travels since my kitchen is still being renovated and various travel will keep me away from being able to cook. First stop: a quick weekend trip to New York. I've been here on a half day jaunt in the past so I'm glad to have a chance to spend a few days to get to explore a bit more. This was our first night straight off the plane and an hour plus commute fighting traffic to get into the city. We stayed just down the street from the New York Stock Exchange which was kind of neat to snap pictures of. For dinner we went to the Smorgas Chef a Scandinavian restaurant (I've never been to a Scandinavian restaurant). It was located just a few blocks from us in the financial district. As you can see Smorgas has a very cozy interior, tables were set elbow to elbow and even the window boxes sat tables for two. It seems the restaurants in the area are located in tiny spaces and they spill out into shared alley/common street filled with picnic benches and umbrellas. It had a very festive and "active" night life feel even though the rest of the district seemed somewhat deserted. There were the occasional pubs here and there but for the most part everything was shut down when it got dark. At the suggestion of the waitress I ordered the Classic Smorgas Bord it features house cured gravlaks with mustard sauce, jansson's potato (a potato casserole), Swedish meatballs with gravy and lingonberry (their specialty), two types of herring, "rosolli" (an apple-beet salad), dill cucumber salad served with a round cracker bread (like a wasa cracker kinda card board like). The two salads were the right amount of vegetable to help offset the potatoes. It was a great sampler of what the restaurant had to offer and just the right amount of food for a light but satisfying dinner. 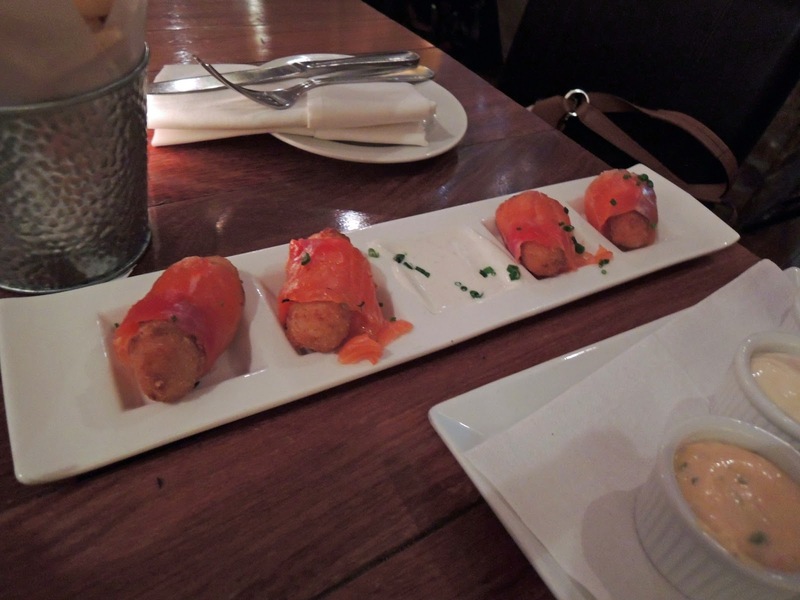 We originally ordered the quartet of herring, they screwed up (to our benefit, the two types of herring from the Smorgas Bord weren't our favorite) and we ended up with the Gravlaks Croquettes. The salmon was house cured and wrapped around a potato croquette served with a chive and horseradish creme sauce. We added a full order of meatballs and some french fries with three dips (a chipotle mayo, regular mayo, and ketchup) shared the whole thing as a meal. They had dessert which we passed on but the table near us had some delicious looking crepe dish ala mode and their cocktail menu was pretty unique. All in all as the first restaurant we visited on our trip it definitely had that trendy New York feel but everyone was so casually dressed and relaxed this pair of Austinites felt very welcome.